Schwing Stetter Blog (UK): Why Pump Concrete? The continuing refurbishment of the offices continues to yield items of interest. A few months ago we filled up a bunch of boxes with 'inessential general office stuff' (for want of a better phrase) and packed them away in storage. 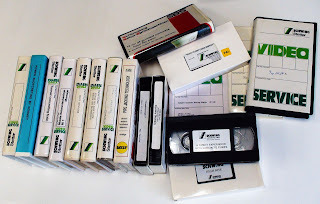 We recently brought them back and had a bit of a sort through, unearthing a not insubstantial collection of corporate videos. Not wanting to lose these historical, if not interesting corporate records, we thought we'd transfer them to DVD. The first of these, which can be seen above, is 'Why Pump Concrete', a 1990s 10 minute justification of using concrete pumps for building projects. All the concepts still apply today, but what is interesting is that the advantages of pumping concrete needed to be pointed out, indicating they were not so self evident back then as they would seem today. The collection of videos contains a fairly wide scope of material including some interesting short documentaries about tunnel building, assembling a Stetter Compact Batching Plant, a 'catwalk' parade of Schwing Pumps in front of a cheering crowd and how to service a flat gate valve, right through to one which started with a promising soundtrack but soon became a not-so-riveting 15 minutes showing a chap shotcreting a wall. Concrete pumps can be very helpful for any construction project to complete the work quickly and a most economical way. Thanks for highlighting advantages of using the concrete pump.